This delightful book describes and interprets a series of paintings for each day of Lent. Artists often address subjects that our culture seeks to avoid, and Sister Wendy's brilliant and perceptive reflections will help you to read these paintings with a more discerning eye, and encounter deeper levels of spiritual meaning than may at first appear. 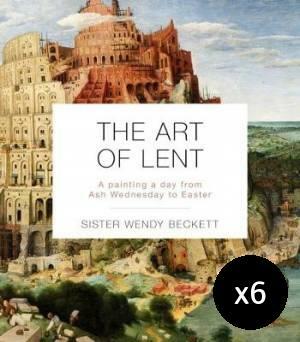 The Art Of Lent - Pack of 6 by Sister Wendy Beckett was published by Eden bundles in January 2018 and is our 32329th best seller. The ISBN for The Art Of Lent - Pack of 6 is EDENBUNDLE-2061. Be the first to review The Art Of Lent - Pack of 6! Got a question? No problem! Just click here to ask us about The Art Of Lent - Pack of 6.